Vegan Runner Eats » Interviews » Everyday Heroes, Episode 2: Meet Neil, the Vegan Cupcake Guy Who Runs an Organic Produce Farm, Leads a Vegan Potluck Group, Just Finished a Marathon – All while Having a Full Time Job! « Everyday Heroes Series, Episode 1: Meet Laura, a Newly Vegan Runner and a Busy Mom! I am extremely excited to introduce you to our second guest in Everyday Heroes series – Neil Frank from Michigan! I first met Neil through Instagram, where he’s known as vegancupcakeguy, and was very impressed by his ability to juggle so many interesting and time-consuming activities at once. See for yourself: he has a full-time job as an architect; he owns and manages an organic produce farm that brings affordable fresh fruit and vegetables to the people in his community; he regularly participates in running races and just ran his first marathon; plus he’s got some crazy cupcake skills! On top of that, he’s a dedicated vegan of fourteen years, and is raising two daughters. Naturally, I had to ask Neil to share his story with the readers of Vegan Runner Eats: we all could use some inspiration and tips from a guy who seems to have figured out how to be successful as a superbusy vegan runner with a serious affinity for cupcakes, all while helping his community! 1) Why did you decide to become vegan? How long have you been following vegan diet/lifestyle? My transition started over 17 years ago. I had known a few vegetarians but hadn’t fully grasped why someone would want to be one until one day it hit me… I asked myself, what the difference was between my dog I called a pet and the cow I called dinner? I realized there wasn’t a difference, and that every animal/sentient being deserved the compassion that I shared with my dog. I wasn’t necessarily religious, but for Lent that year, I decided to give up eating meat.17 years have passed, and I’m still meat-free! Following my decision to stop eating meat, I spent time reading and learning more about vegetarianism, and eventually decided to stop consuming dairy too. I have been vegan for 14 years now. I no longer say I gave anything up because in fact, veganism has expanded my diet like I could have never imagined before. The year I became vegan I was feeling a bit isolated, but thought there had to be other vegans around where I lived (the not-so-progressive middle of the mitten-shaped state [Michigan]). I started a vegan potluck group. There were only two people at the first potluck, but by dropping off fliers at a couple health food stores in the area, within a year we had about 100 people on the newsletter mailing list, and attendance at the potlucks topped over 30 people. The potluck group, Saginaw Valley Vegan Outreach (SVVO) just celebrated its 13th anniversary and is still going strong, meeting once a month for a vegan potluck dinner. It’s so much fun to get together with like-minded people and enjoy a great variety of vegan food. 2) Your running/athletic experience. How long have you been running? What races have you participated in? Have you noticed any improvements in your health/endurance from following a vegan diet? About two years ago, someone had asked me if I would train for the 10-mile Crim Race (3rd largest 10-mile event in the US and close to home) with them, and I said “Sure!” At age 42, I had never done much running before and had only participated in one running event, a charity 5K the year before which was not easy for me. We started training together in January 2012, and at that point I could barely run a mile. Unfortunately, within a few weeks I headed into several months of poor health (strep throat, upper repository infection and then the onset of microscopic colitis). It wasn’t until July 2012 that I was back into pretty good health and felt like I could start running again. The 10-mile Crim Race in August was getting close. With a little more than a month left to train, I decided to still give it a go. The day of the Crim Race the farthest I had run in training was 5 miles, but I endured the 10 miles, running 5, walking for a 1/2 mile then running the last 4-1/2. The emotions of crossing the finish line that day are pretty hard to put into words. That race really turned me on to running. 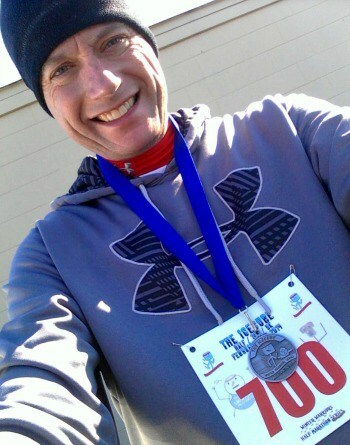 On Thanksgiving Day that year, I ran the distance of a half marathon. It was just on my own and not at an event, but finishing that distance still felt amazing. I spent the summer of 2013 doing a variety of local 5K and 10K runs and ran my first half marathon event in September 2013. A friend asked me if I would ever want to run a full marathon, so I knew what my next goal would be. In December 2013, I registered for the Great Lakes Bay Marathon, another local race that would happen in May 2014. This past winter I ran a series of half marathons [photo at right] rightfully called the Winter Warrior Series because most of them were on snow and ice and with temps in the teens and wind chills near ZERO. 3) Your recent marathon. What was your running/cross-training strategy in training? Did you make any changes to your regular diet (adding more carbs, etc.)? Do you think being vegan gave you an advantage? Any advice for the newly vegan runners training for a marathon? I use the term training loosely because I have never worked with a trainer or followed a training “program” of any sort. When I signed up for the marathon in December, my idea of “training” was to run as often as I could, and try for longer distances when it felt right. About 13 weeks before the marathon, I went online and quickly realized that I should have started a training schedule 16 weeks ahead of the race date. I spent the next 12 weeks running 5 days a week with runs of 6 to 8 miles on Tuesdays, Wednesdays and Thursdays, 4 miles on Saturday and long runs on Sunday starting at around 12 miles at the beginning and gradually increasing to a maximum of 22 miles. I logged over 300 miles of running in the 12 weeks of training despite having bad colds twice during that stretch. I didn’t make any changes to my diet. I’ve always believed that the best way to be vegan is to stay active and eat a variety of foods, and let me body tell me what it needs. There were days when I was craving more protein, so I’d eat more protein. Likewise, there were days when I was craving carbs and would eat more carbs. Did being vegan give me an advantage? I’m not really sure. I do know that while it was a tough race, I ran it with a clear conscience and felt proud to be wearing my “No Meat Athlete” tech shirt! My advice would be to have a training plan early on. Flying by the seat of your pants preparing for a marathon like I did can be a pretty wild ride. 4) Your farming experience. Why did you decide to start an organic farm? What are your challenges/rewards from farming? What do you do with the harvest (use it yourself, sell, donate, etc.)? I started my farm five years ago at a time when I was self-employed as an architect. With the condition of the economy, business was slow and hard to find. I had been a member of a CSA (Community Supported Agriculture) farm for quite a few years and really loved the concept. I’d had a small garden at home, but being part of a CSA was a great way to supplement with additional produce. Obviously as vegans, we go through a lot of produce! I love gardening and thought running my own CSA might be a fun thing to do some day, but with architectural work and my income being slow, I decided to give it a go! Less than a month later, I closed on 5 acres of agricultural land a few miles from home. A few months later when spring arrived, I got busy turning a relatively unused piece of farmland into an actively producing organic CSA farm. Actually it’s a “veganic” farm in that I only use plant-based nutrients and insect/disease control. I feel like I actually surpass the USDA standards for organic production by following them but also by not bringing any animal by-products on to the farm. I offered 12 CSA shares that first year, and it was so successful that I increased the size to 30 shares in the second and third year. The CSA was more than a full time job for me leaving very little time for architectural work other than in the winter months. I found it to be very rewarding, but two years ago the economy started turning around, and I went back to work in a traditional architectural office. At first, I thought of giving up on the CSA aspect of the farm and just growing the produce for myself. 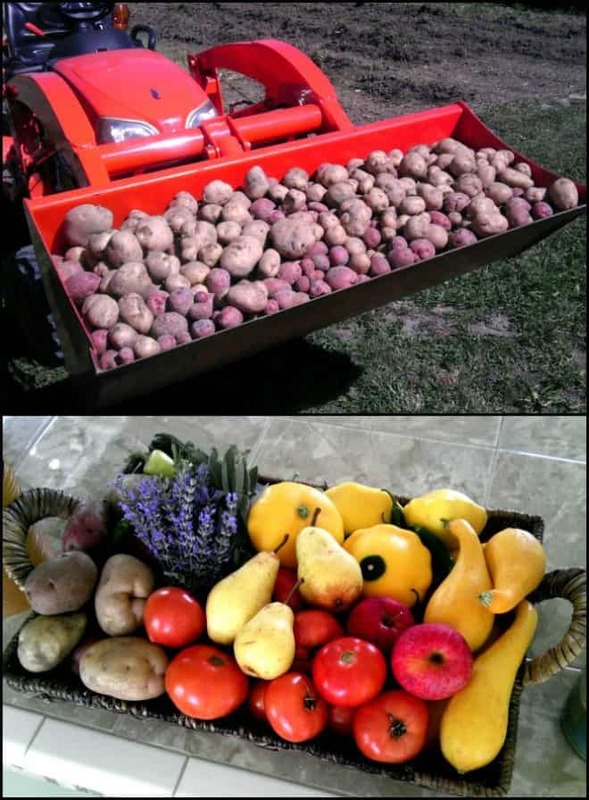 That year, I ended up planting just as much as I always had, so it became necessary to quickly figure out what to do with all the extra produce. I decided to invite some of my most supportive past CSA members out to the farm every Thursday evening to take produce from what I had available. It’s what I call a “pay what you can” approach. I have a box for them to drop money into for what they take, if they can, and to put in what they feel the produce is worth to them. If times are tough and they can’t contribute, I suggest they just do a favor for someone else in some other way. It’s a bit along the lines of a “gift economy” and it really has taken the stress out of what I do at the farm. I’m currently entering my second year of the “pay what you can” approach at the farm and can hardly wait to start piling the tables up with produce for my friends to “shop” from. 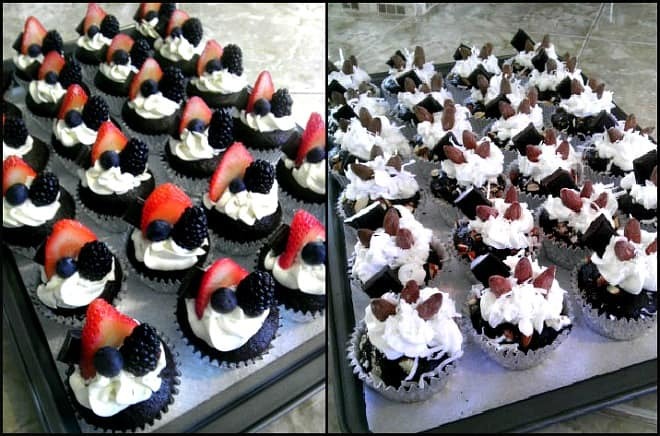 5) Cupcakes! What inspires you to make them? What are your favorite recipes/cookbooks? 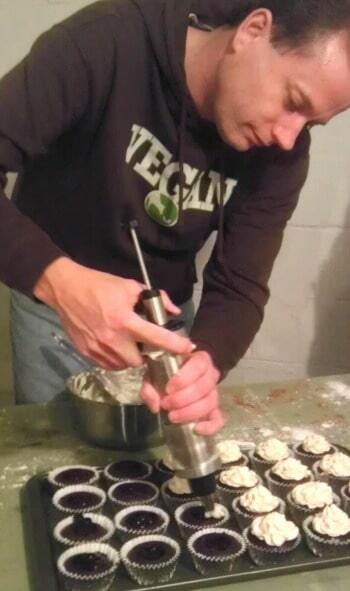 I started making cupcakes about two years ago after buying the cookbook Vegan Cupcakes Take Over the World and discovering how easy it was to make delicious vegan cupcakes for the vegan potlucks I would host. After following the recipes from there a few times, I started coming up with my own ideas for variations on the recipes based on other sweet treats I enjoy… like vegan s’mores! 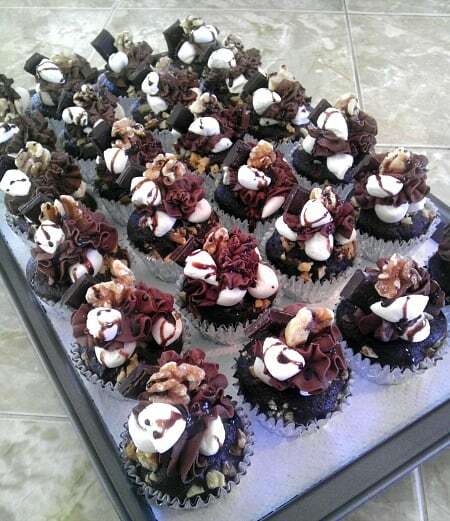 My s’more cupcakes made with vegan marshmallows are pretty popular among my friends. I find making cupcakes to be a great creative outlet. Honestly, I’m not even a huge fan of eating cupcakes, but I do love “building” cupcakes. A friend recently called me a cupcake architect and the name has kind of stuck. I’m currently looking for taller boxes to put my cupcakes in for when I give them away to friends so they actually close without crushing the tops! 6) Time management: Any tips for the rest of us on how to fit so many activities in an average day? I think time management and prioritizing becomes easier when your days are filled with things that bring you joy and satisfaction. It reminds me of the saying, “Where there’s a will there’s a way.” If you look forward to the things you have to do, including your work, you’ll find a way to make time for it all. Having passion for what you do is almost like doubling the amount of time you have in a day, and you’ll live a much healthier life, physically and emotionally too! A few things come to mind… 1) There is no such thing as a perfect vegan. Don’t be hard on yourself for accidentally eating a slice of bread you found out later was made with honey. You probably drove to the store to stock your vegan kitchen in a car that was made with various animal by-products (glues, etc.) Choose your battles… make vegan choices and do the best you can. 2) I’ve found the best way to spread veganism is simply to be vegan. Awareness that leads to change happens with less resistance by being a good example. Trying to “convert” people is just going to be met with resistance [Very much agreed! – Alina]. And 3), on running… I hope you can find the joy in running. Run with a smile. Your body will respond positively. I see so many people that are running that look miserable. As a friend of mine says, “Find the happy.” And really, find the happy in all that you do! Neil, thank you so much for your inspiring story and tips! Good luck to you on your vegan running/farming/potlucking/parenting/cupcaking journey! If you’d like to be featured in Everyday Heroes series and share some vegan wisdom with the readers of Vegan Runner Eats, shoot me an email at veganrunnereats(AT)gmail(DOT)com! To see other stories in Everyday Heroes series, click here. Tagged Everyday Heroes. Bookmark the permalink. 6 Responses to Everyday Heroes, Episode 2: Meet Neil, the Vegan Cupcake Guy Who Runs an Organic Produce Farm, Leads a Vegan Potluck Group, Just Finished a Marathon – All while Having a Full Time Job! What a great, inspiring article! Thanks for sharing! You’re very welcome, Happy Vegan! Awesome story! Love the CSA idea he’s got going! I think I’ll be picking up the Vegan cupcake cookbook. Great way to get the family involved in the lifestyle. I agree, Laura – the CSA idea let Neil take the home-grown veggie idea to the whole new level! This is a great story. Neil obviously has a huge heart & is an inspiration. Thank you Nicollette! I’m sure Neil will appreciate your words!